It’s comforting to feel protected. The list of factors certainly can add up while on the road. Though many of our drives become routine, the streets and highways we travel can throw a curve ball at us at any moment. Of course, none of us want to think about the possibility of getting into a wreck, but it can bring peace of mind to be in a vehicle whose top priority is to keep you safe. That’s why the Insurance Institute for Highway Safety (IIHS) awarded the 2019 Chrysler Pacifica with a “Top Safety Pick” rating. This marks the third year in a row that the Chrysler Pacifica has earned a “Top Safety Pick” rating. The streak started when the minivan launched a new design to its model-year 2017 to enhance safety features. With over 100 available safety and security features, the Pacifica made a lasting impression with its Forward Collision Warning-Plus, which earned the IIHS’ highest-possible rating of “superior.” This feature uses a blend of camera and radar sensors in order to warn drivers of a potential oncoming collision, including Automated Emergency Braking, if needed. The minivan’s body structure also helped it earn its “Top Safety Rating,” built of 72 percent high-strength steel – the most among the North American minivan segment. This does not hurt its fuel economy which boasts a combined city/highway rating of 22 miles per gallon. The Pacifica’s body structure is made of 72 percent high-strength steel. Drive home your New 2019 Chrysler Pacifica today. Visit Zeigler Chrysler Dodge Jeep Ram of Downers Grove to schedule your test drive. We’ve been waiting for a long time to say this: A pickup is finally returning to the Jeep stable after being absent for more than 25 years. The 2020 Jeep Gladiator debuted Wednesday at the 2018 LA Auto Show, and it surprised with class-leading towing and 4×4 payload figures to go with its Jeep-worthy off-road capabilities, Wrangler-inspired looks and healthy helping of tech features. At launch, the Gladiator will be powered by a 3.6-liter Pentastar V6 making 285 horsepower and 260 pound-feet of torque. It comes standard with a six-speed manual transmission and four-wheel drive on all trim levels. An eight-speed automatic is optional. Jeep claims it’ll offer class-leading tow capacity of up to 7,650 pounds and 4×4 payload of up to 1,600 pounds. Those interested in a little more grunt may want to holdout until the 2020 calendar year when a 3.0-liter turbocharged diesel is slated to join the lineup offering 260 horses and a muscular 442 pound-feet of twist. Unlike the gas engine, the diesel will only be offered with an eight-speed automatic. Being a Jeep, the Gladiator offers all the necessary hardware to tackle off-road expeditions ranging from a pair of 4×4 systems, Dana 44 axles, electric front- and rear-axle lockers, a limited-slip and skid plates. Rubicon models dial things up a notch with 4.10 axles, improved suspension articulation and travel, Fox shocks, electronic disconnecting sway bars, steel rear bumper and protective cab and cargo bed rails and 33-inch tires. The Rubicon can run up to 35-inch rubber with no lift, be equipped with a forward camera capable of showing anything that’s less than two feet in front of the truck and be outfitted with a front, winch-ready steel bumper. The Gladiator features an approach angle of 43.6 degrees, breakover angle of 20.3 degrees, departure angle of 26 degrees, 11.1 inches of ground clearance and is capable of fording up to 30 inches of water. From a design standpoint, the Wrangler-design inspiration is clear with the circular headlights, seven-slot grille and square taillights. The Wrangler’s open-air capabilities also make the jump over to the Gladiator with the removable aluminum doors, soft or available hardtops and fold-down windshield. Out back is a five-foot steel bed featuring integrated tie downs, under-rail bed lighting that’s available with a spray-in bed liner, 115-volt three-prong plug and tonneau cover. The sides of the bed box were left low on purpose for easy reach in to load or unload items. The damped, three-position tailgate in the middle setting matches up with the tops of the rear wheel housing and enables the Gladiator to carry 20 sheets of 4×8 plywood or drywall flat. Heading inside, the heritage-inspired layout boasts a horizontal dash with trapezoidal end, plenty of storage cubbies, rubberized touch points and real metal plated trim pieces. For a more premium feel, Overland models receive wrapped instrument panels with accent stitching. Rear seating space mirrors the Wrangler Unlimited for segment-leading legroom with seats that can be folded to provide a flat load surface and access to secure storage areas behind the seatbacks. Folding the rear seat cushions up uncovers an open storage bin with dedicated compartments to safely hold bolts when the doors or top are removed and the windshield when folded. A lockable storage bin with removable dividers is available as an option. Spearheading infotainment is the fourth-generation Uconnect system with either a 5-, 7- or 8.4-inch touchscreen depending on trim level. Both Apple CarPlay and Android Auto capabilities are standard with navigation coming with the 8.4-inch display. The 2020 Jeep Gladiator pickup truck will go on sale at Zeigler Chrysler Dodge Jeep Ram of Downers Grove in early 2019 and be available in Sport, Sport S, Overland and Rubicon trim levels. The All-New 2018 Wrangler stands out with its instantly recognizable grille, iconic round headlamps and square tail lamps, improved aerodynamics, a convenient fold-down windshield for off-road purists, and dozens of different door, top and windshield combinations. Come to Zeigler Chrysler Dodge Jeep Ram of Downers Grove and test drive all the New 2018 Jeep Models. Call 630-241-5500 or visit http://www.zeiglerchryslerdodge.com today. Before the All-New 2019 Ram 1500 takes to the road as the strongest Ram 1500 ever, the no-compromise truck is turning heads at the North American International Auto Show (NAIAS). The next-generation Ram 1500 revealed at NAIAS in Detroit, and is putting on a show of its own with an all-new look, class-leading luxury, enhanced capability, efficient and powerful powertrains and cutting-edge technology. When it comes to technology, the All-New 2019 Ram 1500 redefines what a pickup truck can be, and marks an evolutionary milestone in the history of Ram Trucks. The list of state-of-the-art tech features is seemingly endless, and includes a class-exclusive available 12-inch Uconnect® touchscreen with split-screen capability and tailor-made graphics for the various Ram models; the available 4th-generation Uconnect system with enhanced processing power; available SiriusXM® 360L with customizable on-demand listening and exclusive content; a powerful available 900-watt, 19-speaker Harman Kardon® audio system; new available 360-degree Surround View Camera; available Adaptive Cruise Control with Stop, Hold and Go; available Blind Spot Monitoring; available Forward Collision Warning Plus; and available LaneSense Lane Departure Warning with Lane Keep Assist. Put it all together, and the All-New 2019 Ram 1500 is the most technologically advanced Ram Truck ever. Of course, the All-New 2019 Ram 1500 is built to get the job done, and to get it done right. That means dramatically improved towing and hauling capacity. The 12,700 pounds of max towingmarks a 20 percent increase in towing power, and 2,300 pounds of max payload marks a 22 percent increase. The result is an All-New 2019 Ram 1500 that gets to the worksite, or to the weekend getaway, more efficiently and without compromise — hauling more, with fewer trips and with more efficient powertrains. Other upgrades and notable features of the All-New 2019 Ram 1500 include a 4-inch increase in cab size; the most rear-seat legroom in its class on Crew Cab models; more leather and real wood surfaces than Ford F-150 and Chevrolet Silverado; the best ride and handling with class-exclusive multi-link coil suspension and class-exclusive available Active-Level™ four-corner air suspension systems; best-in-class standard pickup bed volume; class-exclusive available RamBox® Cargo Management System; the most entry-level V6 gas horsepower (305 horsepower) in its class; and much, much more. The 2018 Ram 1500 Hydro Blue Sport will be the final special-edition Sport model the Ram brand will offer for 2017. Visit Zeigler Chrysler Dodge Jeep Ram of Downers Grove to check out the New 2018 Ram 1500 Hydro Truck. The flagship of the Jeep brand, the Wrangler is one of the most easily-recognized vehicles in America. When Jeep announces a new-generation of the Wrangler, it’s an event as momentous as Halley’s Comet: both rare and much-anticipated. Highlights to the new-gen Jeep include a better turning radius, stronger crawl ratio, a new turbocharged four-cylinder engine option, some modern interior upgrades, added technology for infotainment and safety, and upcoming diesel engine and hybrid-electric powertrain options. As old school as the Wrangler might be, being the “Jeep” most people refer to when they use the brand’s name, this newest edition marks only its fourth generation since its consumer market debut in the 1980s. Since then, design details have changed, but the overall appearance of the Wrangler hasn’t morphed too far from the original. Technology has improved the Wrangler’s capabilities and performance, but the tradition of being as rough-and-tumble as they come and as iconic to off-roading as it can be has remained intact. On the exterior, the new Wrangler retains the well-recognized slotted grille and round headlamps that have defined this SUV since it first appeared as a military vehicle in the 1940s. Trapezoidal fenders and a short wheelbase on a square body also remain. The legendary capability to remove doors, lower the windshield, and remove the top are also part and parcel in the new-generation Wrangler. As are heavy bumpers, ready-for-action tires, and a tailgate-mounted full-sized spare tire. The dimensions of the new 2018 Wrangler JL are a bit larger than the outgoing Jeep, with an overall length of 166.8 inches (4,237mm) for the two-door model, versus 164.3 inches for the previous gen. Width and height remain almost the same, though, at 73.8 inches (1,875 mm) and 73.6 inches (1,868.4 mm) respectively, compared to the 73.7 and 72.5 of the JK. The Wrangler’s wheelbase will extend in the new version by about an inch and a half at 96.8 inches (2,460) from the current-gen’s 95.4 inches. The four-door models have a similar growth in size as well. A big surprise might come when noting the overhangs on the new Wrangler. Despite the modest lengthening of the SUV, overhangs increase significantly with the 2018 model having 29.2 and 40.8 inches front and rear (741.6, 1,036.3 mm). That’s about 2.5 and 10 inches longer than the outgoing Wrangler’s 26.7 and 30.6 inch overhangs. These changes in dimensions mean that the new Jeep would have a very different turning dynamic if linkages remained the same. Jeep changed those, however, giving the new steering ratio a boost from 16.7:1 to 17.4:1, which kept the turning radius about the same at 34.5 feet (curb-to-curb) versus 34.6 – roughly 10.5 meters. Turns increased a tad from 3.5 lock-to-lock to 3.6. Another benefit of the 2018 Jeep Wrangler’s redesign is in approach, breakover, and departure angles. The new generation has a 41.4-degree approach angle on its base model and a 44-degree angle on its Rubicon edition. All about two degrees better than the outgoing model’s approach. Breakover and departure angles see improvements of about the same two degrees, starting at 25 degrees for the base and 27.8 for the Rubicon and 35.9 for the base and 37 for the Rubicon, respectively. Ground clearance also improves dramatically, jumping from 8.3 in the base model current-generation Wrangler to 9.7 and up to 10.8 in the new-generation base and Rubicon. Jeep also says that it’s improved the new 2018 Wrangler’s weight by using aluminum on the hood and doors, and magnesium alloy on the tailgate. 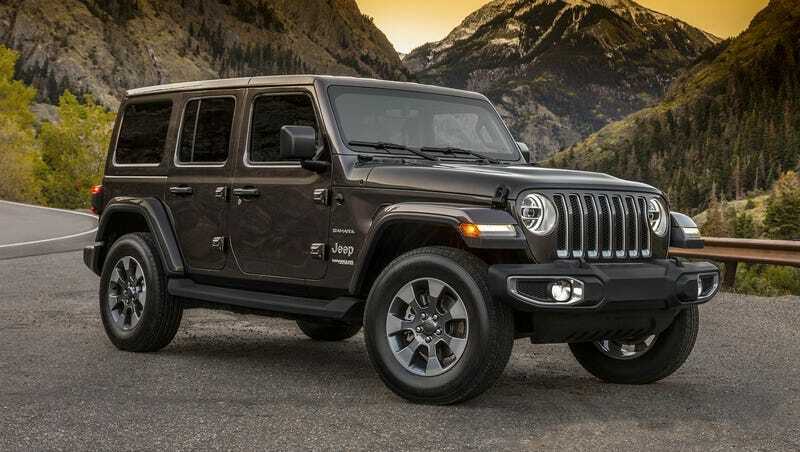 These weight losses, however, seem to be offset by other changes as the curb weight for the new-generation JL is a few hundred pounds heavier than the equivalent model in the outgoing JK. The 2017 Wrangler Sport weighs in at about 3,760 pounds (1,403 kg) whereas the new 2018 Wrangler Sport in its base configuration weighs about 3,955 pounds. It’s the Rubicon model that seems to benefit the most from these weight-saving measures, having just a handful of pounds added (4,145 current versus 4,129 outgoing). The 2018 Jeep Wrangler will continue with the 3.6-liter Pentastar V6 it’s been using for years, but that engine sees several upgrades commensurate with what it’s seen in other Fiat-Chrysler models it’s used in. For reference, engine displacement and outputs remain unchanged from 2017 at 285 horsepower (209 kW) and 260 pound-feet (353 Nm) with RPM peaks for those outputs also staying the same (6,400 and 4,800 respectively). The greatest changes are a lower compression ratio, down to 10.2:1 from 11.3:1, and a resulting lower oil and coolant requirement (down 1 liter for oil, 3 liters for coolant), reducing weight. Added to the upgraded 3.6L is engine stop-start for improved efficiency, now rated at 17 mpg city, 23 mpg highway, 19 mpg combined (13.8/10.2/12.4 l/100km) for the standard transmission and 18/23/20 mpg (13.1/10.2/11/8 l/100km) for the automatic transmission-equipped model. This engine is now built in Saltillo, Coahuila, Mexico. Added for the 2018 Jeep Wrangler in the new JL platform is a 2.0-liter turbocharged four-cylinder. This engine outputs 270 horsepower (200 kW) and 295 lb-ft (400 Nm) at lower RPM (5,250/3,000) than the V6. This means that the turbo-four will have about the same output as the V6, but deliver it faster and with better torque to boot. Off-roaders understand why that makes a big difference as torque is what it’s all about. Fuel efficiency numbers aren’t released yet, but this little engine has the same towing capacity as does the V6 and will use the same transmissions. It’s a part of the same engine family developed by Ferrari for Alfa Romeo, and will be built in Chrysler’s Trenton, Michigan plant with overflow coming from Termoli, Italy. The 2018 Jeep’s transmissions are an eight-speed automatic, which has been seen in many Chrysler-Jeep vehicles in recent years, and a six-speed manual transmission similar to that offered in previous-generation Wrangler models. Both have improved gearing at the lower end to add more torque than ever before. The automatic, which is standard in the I4-equipped Wrangler and optional on the V6, has a first-gear ratio of 4.71 and a second-gear of 3.13. The manual trans has a 5.13 and 2.63 first and second gear ratio. Those are both about a point higher than the first and second gear ratios of the outgoing model’s transmissions. Transfer case ratios remain almost identical from the outgoing to the new-gen, with crawl ratios of 2.72 to 4.1 from base model Sport to legendary Rubicon. Front and rear axles also remain the same Dana 30/35 and Dana 44 offerings from the current-generation, but with slightly different ratios (3.45 vs old-gen 3.21) in the base model. The chassis for the 2018 Wrangler remains body-on-frame, of course, but the front axle moves from a live axle to a solid axle configuration, keeping the sway-bar disconnect system as standard equipment for the Rubicon. Shock absorption depends upon the package and wheel size, but remains equivalent to what was offered in the outgoing 2017 Wrangler. Braking in the 2018 Wrangler gets more robust, though, with rotors up front changing to 12.9x.94 inch (330×24 mm) vented rotors on the Sport model and 12.9×1.1 (330x28mm) on the Sahara and Rubicon models. Calipers are now 1.88-in (48mm) twin-pistons on the Sport and 2-inch (51 mm) twin-piston on the Sahara and Rubicon. Rear rotors and calipers are 12.9x.47-inch (328×12 mm) rotors on the Sport and 13.4x.55 (342×13 mm) on the Sahara and Rubicon. Calipers are 1.77-inch (45mm) and 1.88-inch (48mm) on those models as well. Stopping power is about the same, with larger rotors and slightly smaller calipers for the new-generation Jeep compared to the outgoing models. On the inside of the new 2018 Jeep Wrangler, we can see use of the newest-generation Uconnect infotainment, remedying a chief complaint we’ve had with Wrangler models in the past. Also added are creature comforts like a usable arm rest between the front seats, more head and leg room, and an easier-to-use soft top. The soft top now uses plastic rails that snap into place on the roll bars, eliminating the yoga-inspired engineering required for installation of the soft tops of old. The new roll cage’s profile and the soft top’s installation method mean less wind buffeting at speed, Jeep engineers say. Jeep also labeled hinges and release points for doors, windscreen, etc. with the tool required to remove them (tools come as standard equipment), simplifying the learning curve. The 2018 Jeep Wrangler was revealed at the Los Angeles Auto Show, and is expected to enter showrooms in January of 2018. Fiat-Chrysler has promised more information about the new Wrangler before it hits the streets publicly, as well as estimated release dates for the diesel and hybrid powertrains, along with their specifications. Visit Zeigler Chrysler Dodge Jeep Ram of Downers Grove to test drive the All-New 2018 Jeep Wrangler. Jeep just released the first official images of the 2018 Jeep Wrangler, JL. And while it looks a lot like the current JK, there are a number of notable differences. The most capable SUV ever delivers even more legendary Jeep® 4×4 capability, a modern design that stays true to the original, advanced fuel-efficient powertrains, more open-air options, and is loaded with more safety features and advanced technology than ever before. The all-new Wrangler’s unique design includes an instantly recognizable keystone-shaped grille, iconic round headlamps and square tail lamps, improved aerodynamics, a convenient fold-down windshield for off-road purists, even more open-air freedom, and dozens of different door, top and windshield combinations. The photo above seems to show a windshield that folds while keeping the A-pillar in place. The current JK takes that pillar with it in what is a painstaking process to get the windshield down. Jeep says the JL’s windshield-folding process is “convenient,” which already makes it 100 times better than the JK’s. You can also see what looks like a vent behind the front fender and a turn signal on the front of it. The interior looks to show a manually-activated transfer case (like the Jeep gods intended), a manual transmission (like the Jeep gods intended), a real hand-brake (like the Jeep gods intended). Here’s another photo from the top. The hood looks pretty. Frankly, the whole thing looks pretty (especially with the headlights that carve themselves into the grille), though I haven’t decided what I think about that beltline running along the doors in that top photo. Check out more information on the 2018 Jeep Wrangler Body Styles by visiting Zeigler Chrysler Dodge Jeep Ram of Downers Grove. Dodge and SRT enthusiasts have been clamoring for a factory-production Hellcat with even more grip. We listened. To start, Dodge engineers and designers took the world’s fastest quarter-mile production car,* the new Challenger SRT Demon, and transferred its style to the new 2018 Challenger SRT Hellcat Widebody for improved performance on the street and a bolder, more aggressive new look. You wanted more grip? You got it. With the new Widebody fender flares that add 3.5 inches to the overall width of the Challenger Hellcat, the Widebody model joins the Challenger SRT Demon as the widest Challengers ever. These wider fender flares cover the new 20 x 11-inch “Devil’s Rim” split-five-spoke aluminum wheels, which ride on new, wider 305/35ZR20 Pirelli P-Zero tires with a new tread pattern for added grip on the road and the track. Complementing the 2018 Challenger SRT Hellcat Widebody’s menacing stance is a power-bulge aluminum hood with center intake and dual heat extractors; Hellcat-exclusive new grille and fender badges, along with a raised SRT Hellcat badge on the rear spoiler; exclusive illuminated air-catcher headlamps that feed air directly into the air box and engine bay through the center of the parking lamps; and quad projector headlamps that give a unique detailed appearance, while the aggressive brow “chops” the upper portion of the lamp design for a sinister look. Under the hood, the 2018 Dodge Challenger SRT Hellcat Widebody owns the road and the track. Powered by the 6.2-liter supercharged HEMI® V8 with 707 horsepower and 650 lb-ft of torque, the 2018 Dodge Challenger SRT Hellcat Widebody can be paired to either the Tremec six-speed manual or TorqueFlite® eight-speed automatic transmission. On the track, the 2018 Dodge Challenger SRT Hellcat Widebody boasts a top speed of 195 mph, and 0-60 mph acceleration improved by .1 second (3.4 in Widebody vs. 3.5 in standard Hellcat). Even more, the ¼-mile elapsed time (ET) improved by approximately .3 sec (10.9 ET in Widebody vs. 11.2 ET in standard Hellcat), while the road course lap time on a 1.7-mile track lowered by approximately 2 seconds per lap. Lateral skid pad grip increased by .04 g (.97 g in Widebody vs. .93 g in standard Hellcat). The 2018 Challenger SRT Hellcat Widebody is equipped with a new electric power steering (EPS) system with SRT Drive Modes that add new selectable steering tuning for the first time on a Hellcat model. The new EPS and SRT Drive modes offer drivers a tailored experience by controlling horsepower, transmission shift speeds, steering, paddle shifters (automatic transmission only), traction and suspension. On the road and the track, owners will experience improved handling, and will notice better steering feel and ease of turning efforts at parking lot speeds. In addition to steering, the 2018 Challenger SRT Hellcat Widebody features a standard Brembo® brake system that includes two-piece 15.4-inch front rotors and six-piston front calipers that help provide outstanding heat management and longevity. And for even more control, the front splitter (shared with Demon) and rear spoiler (from Hellcat) deliver responsive and balanced handling at high speed. The new 2018 Challenger SRT Hellcat Widebody completes the Dodge brand’s most powerful muscle car lineup ever, and will be available late summer of 2017 in 15 exterior color options. Visit http://www.ZeiglerChryslerDodge.com to reserve yours today!